nj arts maven: TWO SPECIAL WORKSHOPS FOR PLAYWRIGHTS & ACTORS @ LUNA STAGE: SPOTS STILL OPEN! 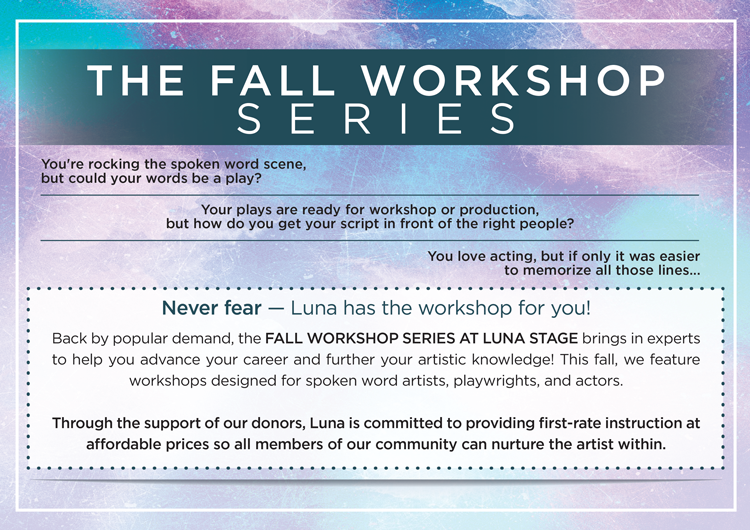 TWO SPECIAL WORKSHOPS FOR PLAYWRIGHTS & ACTORS @ LUNA STAGE: SPOTS STILL OPEN! Lia Romeo is a published, produced, critically-acclaimed playwright. Come benefit from her experience. So you've written a play...now what do you do with it? Lia Romeo is a nationally-produced playwright and has also worked as a literary manager for companies in New York City and New Jersey, so she's seen the submissions process from both sides and knows what works and what doesn't. In this workshop, Lia will cover topics like where to look for submission opportunities, how to network and form relationships with theater companies, how to write a synopsis and a personal statement, and more. Jared Kelner is a Master Teacher who has led classes across the country. Come and learn his unique approach. Attention actors! If you've ever struggled to remember your lines, the creative memorization techniques taught in LINE? will help you break through your mental blocks and accelerate the line memorization process. Author Jared Kelner has applied his experience as an actor and acting teacher and combined that with his expertise as a memory improvement trainer and created an imagination and sensory based process for actors to use when memorizing lines. It's an innovative approach to line memorization that taps into the actor's imagination and acting training rather than relying on monotonous rote memorization methods. Seminar includes the eBook LINE?, The Infinite Memory System (a 10-hour memory improvement audio program), and 3 months of email support from the author.